For more than 75 years, the Aaron Companies have been dedicated to one common goal: "To provide our customers with quality equipment, dependable service and competitive prices." 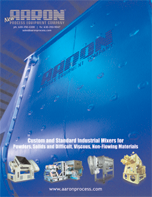 This customer satisfaction has earned Aaron Process an International reputation as one of the world's leading dealers in New Process Equipment . Throughout the past half century, and into the next, this commitment to customer satisfaction will continue to be the foundation for our success.